1. 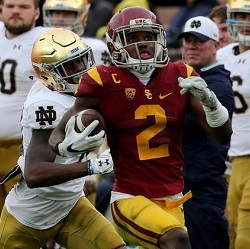 Adoree Jackson, CB, USC (NCAA) — Defense was actually the least impressive of Jackson’s multi-faceted feats in USC’s 45-27 win over Notre Dame on Saturday. Jackson had two tackles and two pass breakups against the Irish. He also had a 52-yard touchdown catch while playing offense, a 55-yard punt return touchdown, and a 97-yard kickoff return touchdown.